Brown Russia gilt-tooled probably by Douglas Cockerell for William Morris, ca. 1895, in green morocco case lettered: Clare-Pembroke Psalter English c. 1220 from Reading Abbey. The Benedictine Abbey of Reading; 14th-century obituaries of the Mareschal family; 15th-century obituaries of William Fitzrichard, Alice Fitzrichard, William Spencer, 1494, Elizabeth de Burgh, Dame de Clare; Edwardus Apriceus (perhaps ap Rhys) written in a 16th- or 17th-century hand on fol. 167v; Thomas Bateman (ca. 1860); sold by William Bateman through Sotheby's, (London, May 25, 1893, lot 1412) to Quaritch; purchased by William Morris, ca. 1895; Richard Bennett (purchased from Morris's estate, 1897); Catalogue of manuscripts and early printed books from the libraries of William Morris, Richard Bennett, Bertram, fourth Earl of Ashburnham, and other sources, no. 17; purchased by J. Pierpont Morgan (1837-1913) with the Bennett Collection in 1902; J.P. Morgan (1867-1943). 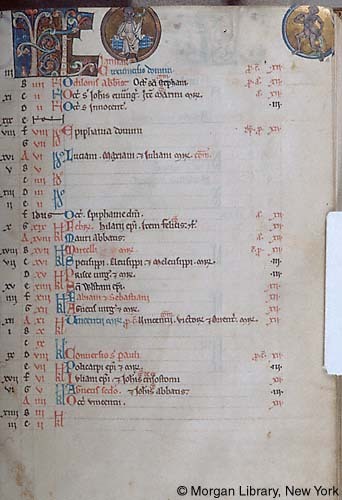 Ms. psalter for the use of Sarum (Office of the Dead); calendar for the Cluniac Abbey of Reading, Berkshire; written and illuminated in the Oxford region of England, ca. 1250. Decoration: 20 calendar roundels (missing May and June), 5 large, and numerous small illuminated initials, some with dragon terminals.